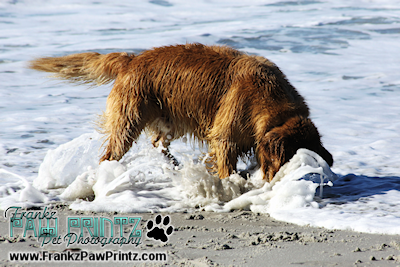 Say Woof Petography: Another Beautiful Day at Carmel Beach Not to be Missed! Another Beautiful Day at Carmel Beach Not to be Missed! Nothing like having today hit the low 60s....and to make things even better, the forecast for this whole week is sunny and in the 60s. 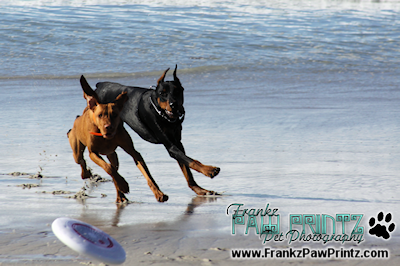 So, not only did I hit the beach today with my camera and "Rocky", my Red Doberman ... I plan to hit it a few more times this week. It wasn't as busy as it was on Sunday, but there were still some great dogs playing on Carmel Beach. 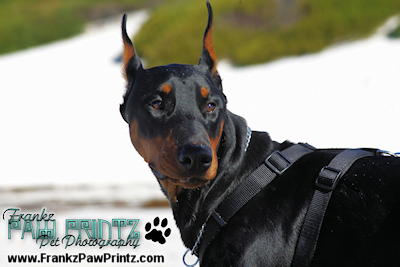 I always love it when we run across another Doberman...I'm amazed at how many Red Dobies I've seen. But today we met Bogie, a nine month old Black Doberman. He was having the time of his life playing with not only Rocky, but also "Harpo" a Golden Retriever that had no problem sharing his frisbee and a Rhodesian Ridgeback puppy. Harpo looking for his frisbee in a wave. BTW, You'll find many of my pet greeting cards at Fine Art America. WhoooHoooo Thanks Zazzle for Another TBA Award!